Jay Boddu is Vice President of New Products at Juniper Networks, where he is responsible for shaping ideas into profitable businesses. He is currently leading the development of a class of new products that leverage Artificial Intelligence and Machine Learning to reimagine Networking Products. Concurrently, Jay is a visiting scholar in the Computer Science Department at Stanford University with a focus on Artificial Intelligence and Machine Learning. Jay previously was with Sofinnova Ventures where served as a Kauffman Fellow. At Sofinnova, he led several investments in early stage technology start-ups. 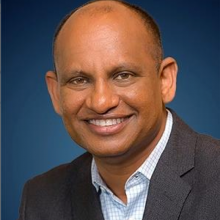 Prior to Sofinnova, Jay held product management and product development positions at Juniper Networks, ATI Technologies (acquired by AMD), Sun Microsystems (acquired by Oracle). Jay has completed the Advanced Management Program (AMP) from Harvard Business School, an MBA from Santa Clara University, a MS in Electrical Engineering from Iowa State University, a B Tech in Electrical Engineering from Indian Institute of Technology, Mumbai.